Nevermind that this app is just a lazily forked and re-branded version of Neo Smartpen app, it’s an unmitigated disaster at doing the very thing smart pens are supposed to be useful for- backing up and digitizing notes. I invested in 5 moleskine Ncode notebooks and this app doesn’t tell the difference between any of them. If I use two notebooks of the same type, I have to lock one, and then unlock the other. This process is HORRENDOUS. No shortcuts through Siri or a widget app or anything else to make it simpler. To make it worse, backups to Google drive are spotty and totally non-functioning for me for the past several weeks. Numerous other notes: - The design of this app looks like it came straight out of iOS6. The UI is a disaster. The scroll wheel interface is garbage, time-wasting and frequently overscrolls - Backup is garbage - Notifications are non existent. The app isn’t smart enough to remind you if you haven’t backed up to cloud in a while and doesn’t let you know if your account is disconnected. - Interaction with the pen is through a UIAlert!? What is happening here??? Why, why would you do that? It’s the roughest and least user friendly product I’ve ever encountered tried to a major brand. Moleskine should be embarrassed to be associated with this application. Can’t use it on my iPad with Apple Pencil, it wont let me use the app until I set it up with a moleskine pen which I don’t own nor I intend to do, making my way back to notability as I’m typing this review. I’d like for he devs to work on an app like notability with all its features but with TH moleskine looks, I use actions and Timepage for a while now and absolutely love them, moleskine looks are classy and great and this app is a missed opportunity that I wish they turn around. The day you folks make that happen I’ll be using that app. Fail to let user calibrate the pen. Not working since the beginning. Unbelievably poor product from a top stationary company. This app and the pen seem to be useless. Certainly not value for money. The captured files look like chicken marks, the search doesn’t work and the pen is a plain old ball point that is not a pleasant writing experience. Hugely disappointing from Moleskin. Update: it doesn’t sync with Evernote any more. It pretends it’s syncing. But nothing goes to Evernote. FIX IT PLEASE. Update: I liked this before. But now it doesn't work any more. PLEASE UPDATE THE APP. I really like this combination. I find it useful at work and personal use. Now they need to enhance the app. For example I'd like to manage my To Do list. In addition to sync with Evernote (which I am very thankful that it does) I think they should back up to iCloud as well. I want to be able to access my notes on my iPad and other iPhone too. Currently you can be Bly connect to one device. I'm sure there will be enhancements coming. I bought this after reading technical reviews praising it's capabilities. Note to self: talk to an actual user, or read the app reviews before buying! I was stupid enough to buy a second pen after losing the first one within the first week. The pen/paper communication is seamless; the problems begin when you want to convert the information into a format you and others can read, review, or modify. The text conversion is bad. The picture conversion is clunky. The sharing options are limited. There is no real support, only a YouTube video that makes it all look seamless but provides no step by step guides. After living in Italy for awhile, I understand this to be a quintessentially Italian product: beautiful on the outside with limited functionality, and zero hope of actually getting it to work. And asking for support?? You might as well have killed the Pope. I'm assuming all of Moleskine is off for riposso, having pranzo and a Prosecco before taking a nap. Grazie per niente! Moleskine completely misses the mark here. Buggy from start to finish, and awkward even in the rare instances when it “works” as intended. Precisely not what you’re looking for if you want to capture ideas or take visual notes. The pen syncing and connectivity stuff works great, but the app itself suffers badly from Chinese-to-English translation issues. It was clearly ported to US/English hastily. It could be amazing if those issues were resolved and the app UX/UI experience was refined and better designed. I’m impressed with how well everything functions though. It’s nice to be able to use it while it’s not connected to the phone/app, and then sync it all later. The transcription functionality works surprisingly well too. I have the Ellipse+ Moleskine pen and the smart notebooks and planners, and they all work exactly the way they are intended. I love that when I write in my planner (though I’m not using it full time yet, since it’s for 2018) it shows up nearly instantly on my iCal calendar, same for my notebooks, when I have the app open, it shows up right away, or very quickly after connecting when I use the pen without first opening app and connecting. I’ve not yet figured out the auto save feature, (I have it set to auto save to Evernote and nothing seems to be there) I wish I could find a user guide for the app so I’m not just “playing around” to figure out the features, even though overall it is very simple to use and figure out. I also have a LiveScribe and I prefer this one to that. Edit: on the IPad version there is a link at the bottom of the menu that allows me to back it up to Evernote, but I cannot see that on my phone app. Maybe the phone app needs an update to work better with the IPhone X screen settings? Would be nice to see the same options on both devices. Just spent $200 on this, but the email function is not working. Way annoying to have to waste the first few pages of paper testing this. It doesn’t work and I can’t delete it or reinstall to try and correct. Very poor experience. Don’t waste your time with it. 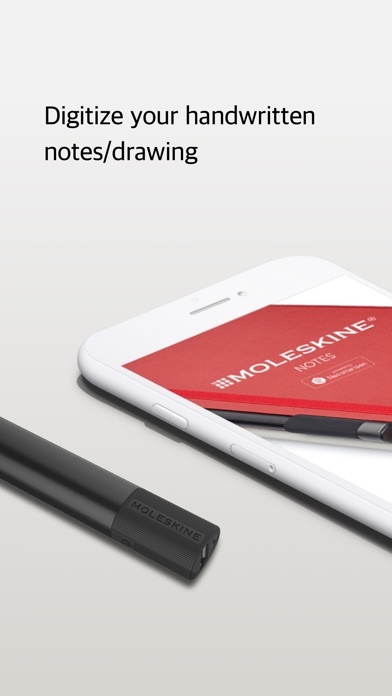 Summary: If you have not purchased this corresponding physical Moleskine product, I cannot recommend this app. This app is similar to the other digital Moleskine apps that currently do not provide an enjoyable experience. 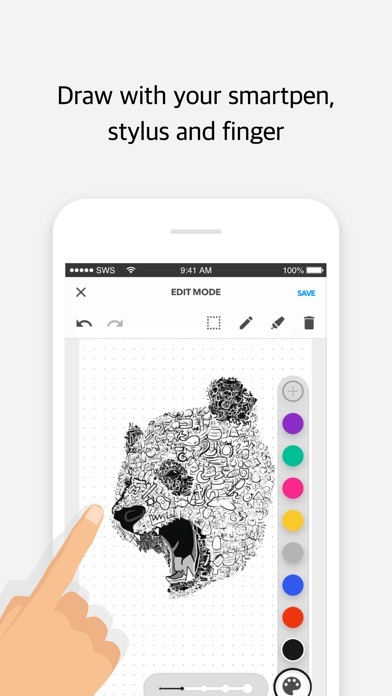 Although this app's intention advertises a way for creations and thoughts the user can record...it excludes use of Apple Pencil, Pencil stylus by 53 or anything but the Moleskine Pen that they are trying to sell folks. However, the other Moleskine journal app provides support for alternate input methods. Unfortunately, it is outdated. My takeaway is that I feel the company doesn't place me and my needs at the center of everything they do. I look forward to seeing apps that are serious about providing creative, professional users who require powerful tools that can handle their tasks. I was hoping for the same feeling I get when using their physical products. Overall the Smartpen and Smart Notebook are working perfectly. To address some points made in previous reviews: - Works perfectly with iPhone 7 and IOS 10 (App V 2.0.1; Pen Firmware v.1.05) - It does need the n-coded Notebooks - Pen has been switching on every time the tip is pressed to the n-coded paper for more than 1 second (can also manually switch it on with button on pen). - Once you start writing on n-coded paper with Pen on, it accurately records the writing Don't forget to switch it on). Many pages can be written and the data stored in the pen - the data can then be transferred to the 'Digital Notebook' within the Moleskine Notes App, or to Google Drive, or Evernote. - Pen data transfer has been working perfectly for more than 2 weeks (used every day). 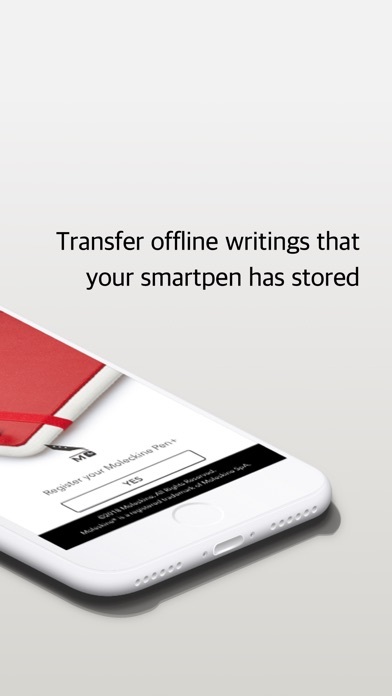 Just select the 'Pen Data Transfer' in the Main Menu in the App. 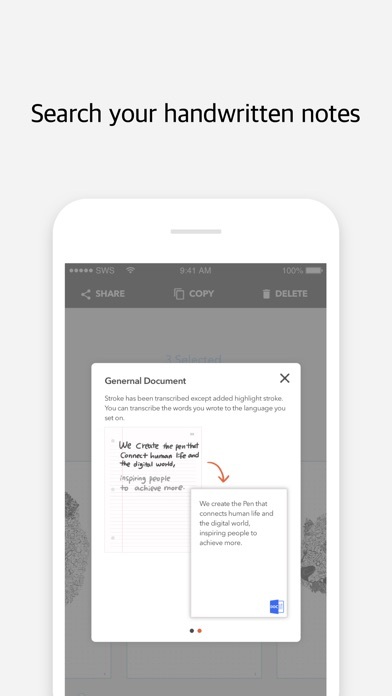 - If you make a Bluetooth connection with the app open (select the pen icon at the TRH side of a Notebook page within the Notes App), then you can watch your notes appear in the app in real time as you are writing into the n-coded Notebook. So far every word written has been accurately transferred into the Notes App, and transferred to Google Drive. I really like that I can select a pen color and thickness that is remembered from session to session. Also - I can make my date entries a different color (red) than the other text in my digital notebook, and highlight selections. Being able to instantly email a PDF of a page to myself by touching the pen to the envelope icon on the n-coded paper is also really useful. The pen seems to last 5-7 hrs between charges. Overall - a great product. The biggest weakness is the lack of documentation. It really takes a few hours of using it to become familiar. There are many ways the app could be improved, and lots of possibilities for enhancing the functionality, but this version works and is useful. Follow-up: just received a 3-pack of College Notebooks from NeoLAB Convergence (Amazon). Loaded the Neo Notes App, restarted the pen Bluetooth (holding power button for 5 secs) and started writing on the n-coded paper. The Notebook appeared in the App and my notes appeared. Works perfectly. Now I can use Notebooks to work up ideas, and the Moleskine for permanently recording them. After the app update, the pen only works when the app is open. It will not allow me the option to download the pages of data written when the pen was on but the app was closed. I hope someone bothers to address this issues and support this product. So I am kicking myself for spending $200 for this thing. Followed the directions exactly. When I go to use the pen, nothing shows up in the app as it is supposed to, even though it says it is connected. This means I am writing test notes all over the first page of notebook that costs about $30 to replace, in addition to the frustration of the notes. Perhaps the pen I received is defective, otherwise the instructions as they are listed are skipping a step. How do you add a page to the notebook? I don't know. Can't find it in the paper instructions or online. Incredibly frustrating. Spent well over an hour trying to troubleshoot this. Felt like throwing it through my closed window. Just in case it was me, gave it to my husband (who is even more tech than myself) and asked him to get it working. He spent even longer than I did. Was so so so excited about this product. Now I am embarrassed I bought it. Ok, the system isn't perfect and doesn't cater to everyone's specific whim. Get over it. The system does what it promises and is one of the best interfaces on the market to blend both paper and digital media. I won't repeat all the features here. You can read that at their website. For sketches and graphics, the system works very well. If you want to archive written notes in multiple formats to a variety of systems, that also works well. I do think the OCR could be improved, however I don't believe a better one exists on the market at this time. If you want perfection, grab a laptop and type your notes. If you want to quickly and easily archive your handwritten meeting notes or sketches, this is a great system to do so. Albeit a bit pricey. Confusing UI and no Dropbox support are big negatives. 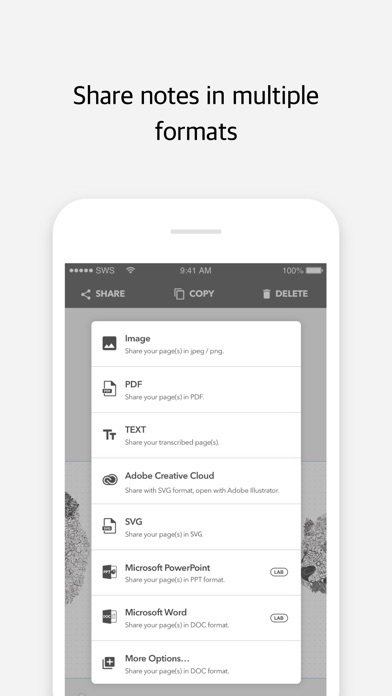 The app has Google Drive support, Evernote support, and email support. I find it strange that the moleskine journal has Dropbox support and moleskine notes does not. It worked very well for one day. On the second day, the app was only able to get notes from the pen when it was directly connected. Great start. Works just like it says, interface makes sense and the search option is great. Able to upload pages to multiple types of programs. Although I wish it was possible to send multiple pages at once. It would also be great to have the transcription recognize multiple languages at once, rather than having to select just one. Also looking forward to larger notebook options, transferring text from the small notebook doesn't work great with word processing programs. Overall though I'm really happy with it! Ok this is pretty great, getting used to the interface only took a few minutes of fooling around. Not buggy at all either which is impressive since it's so new. My favorite part is how tapping the email button on the book selects in on the app, that made me happy.